Not to be confused with Trader Joe's Spicy Chai Latte Mix, this beverage is full of black tea and chai spices, and it's every bit as tasty as its previously-reviewed cousins. As soon as hot water hits one of these teabags, there's a smell of fragrant spice in the air—similar to the scent of potpourri in one of those country stores that sells really expensive candles, wooden signs, and Boyds Bears run by mean, ultra-conservative old people that don't like Gen X'ers—but you go in anyway because you know you'll find the perfect Christmas gift for Mom there. That's how it smells. Like that...but a little more exotic. It tastes like that, too. Just by itself, there's enough complexity and richness to keep your taste buds occupied. Even I, with my child-like sweet tooth, was able to stomach this stuff plain. Add sugar and half and half for a dessertier indulgence. Don't tell me "dessertier" isn't a word. It rolls off my keyboard more easily than "more dessert-like," and it's more appropriate here for some reason. The flavor tingles the tongue, but it doesn't burn the throat at all the way some chai has done to me in the past. There's a good bit of caffeine in one cuppa this magical tea. I can't give you the exact milligrammage, but according to Chai-Direct.com, it has about 40mg per 4oz. I swear this stuff woke me up better than a regular cuppa coffee, but maybe that's because I drank more than 4oz each time I had it. I like the monkeys and elephants on the box. I'm buzzed with caffeine. Sometimes that gives me little ADD fits and I find it hard to focus. Sonia loves this chai. And she's a self-proclaimed chai fanatic. She even tried the Oprah Chai, but she likes this stuff much better. This chai even tops her previous favorite, Tazo. She gives it four and a half stars. I guess I'll give it four. Love this stuff... Added a bit of pumpkin spiced creamer that I had in the fridge over the holidays & it was a tasty cup of tea! Getting another box! Nice! Sounds yummy. You know they have pumpkin spice chai latte too? I love this tea! 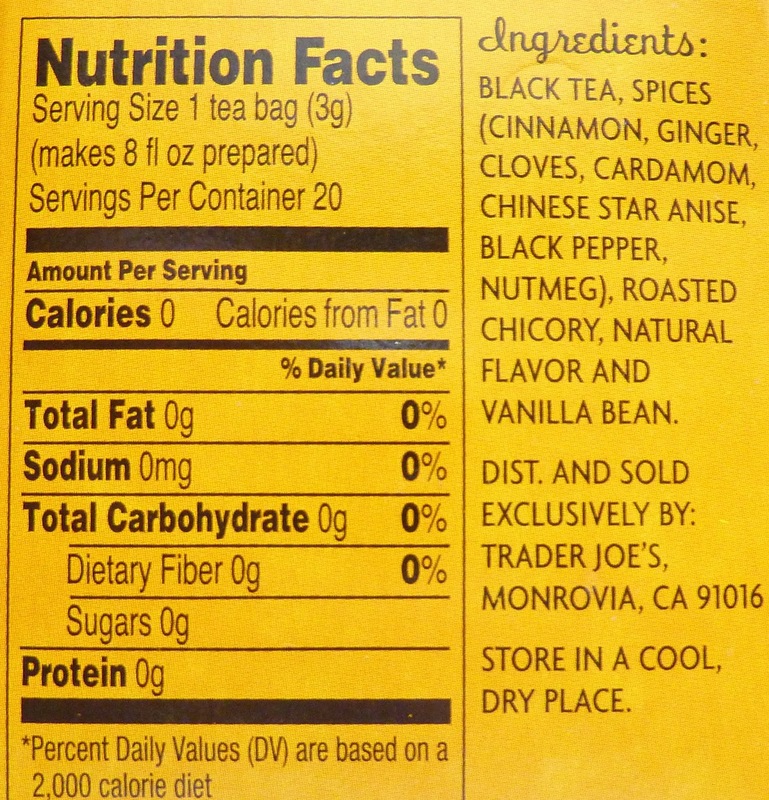 Once, I bought like 10 different boxes of dessert flavored tea, and this was the first box to run out. OMGOSH!!! Since I recently put down coffee? Bored with the Always Coffee thing?? And frofound fact Iam just not TOTALLY ENJOYING IT?I have been on the hunt for different PLAIN TEA BAGS OF RICHER SPICES OF chai teas WITHOUT POWDER MIXES SINCE Iam on WeightWatchers..those powder mixes pack on weight!! and I came across after searching many many others Chis?? 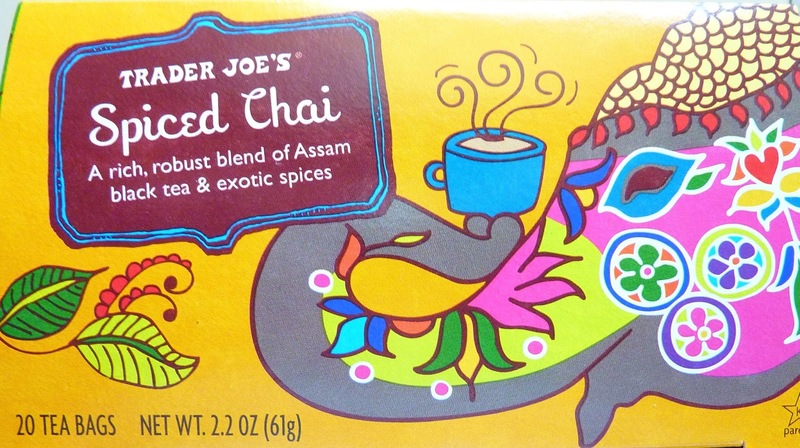 this TRADER JOES SpicedChai?Stands alone absolutely alone!!!!!! I put 2 tbsp of market creamer and 2 splenda..I Sprinkled lil cinnamon Too!Wow a real curl up an TotallyENJOYED..Before my shower and Jam on for my Day! Safeway makes a good Extra strong chai tea bags too? But not like this!! "THERES OTHERS YOU KNOW?BUT NOTHING COMPARES TO TRADER JOE'S"!!!! This is a super excellent tea. Can't be beat as far as chai goes. I add my own creamer once brewed (recipe for the mix: 410 g organic half-and-half; 60 g sugar (I use Baker's superfine); 30 g pure vanilla extract. The combo of this brewed tea (doubled bagged) with the sweet vanilla cream is extremely good!! !